I would like to start from the pictures related to the production processes of Cecilia Vissers’ work. They are images related to my enquiry to get more details about her studio, as I believe that the workplace offers important notions to observe about every single work that is produced there. Perhaps that is not an educated reading, but an emotional one and it is based on information that the “making of art” has always disclosed. That also turned out to be the main subject of our meeting in Cologne, in view of this collection of work. The studio presents technical and laboratory-related aspects that are far from the traditional romantic chaos of painting or from the sculptor expressionist pathos. Yet, what caught my attention were two images taken by the steel plates cutting and aluminium machining laboratories. Photographic documents, capturing the overturning of the work surface areas and the detail related to the water jet, reveal a technological process that influences an aesthetic, analytical culture. Values such as detachment and estimation, the machine’s absolute precision, evidence such as the absence of smears on the materials utilized, all of this becomes part of the artistic work of Cecilia Vissers. The peculiarities of this type of framework create a production of works-sculptures characterized by a visual grammar and a formal vocabulary, which is essential but in constant renewal. The artistic production during the course of these years multiplies variants and solutions thanks to change of the size and the number of factors involved in multiple composition. 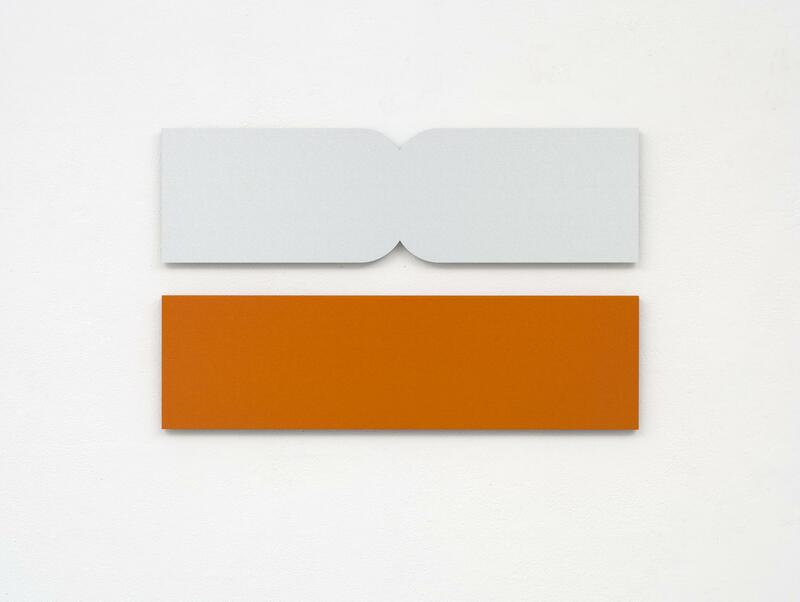 Also in terms of chromatic choices, the possibilities of creative intervention that Vissers determines seem to be greatly reduced, acting on the perceptual concentration of orange-vermilion, light silver and black. These colours do not detach themselves from the industrial production framework, so that their contribution strengthens the technological entity and the objectivity of communication: all indications that bring us back to the lab-studio structure marked by an extensive presence of light. Based on these structural data, Cecilia Vissers predisposes an organic and rigorous artistic production within which the eye and the reading venture into. The deployment of sculpture-pages echoes the action of scrolling actual pages, both horizontally and vertically. Attention is focused on bichromatism, on formal, overlapping variables and different dimensions: sculptural pages that look precious in small sizes and majestic in large plates that impose themselves on space. Following the collection that this edition brings together, perception realizes that Vissers’ vocabulary abandoned the tale of figuration, points to pure poetic tension, and avoids development and narrative; but concentrates on the unique, minimal value of the phrase. The expressive experience of any supra-structural reduction of reality leads to the search for a linguistic-expressive value based on the excavation of absence. With the idea of finding even in the absolute minimum, the purity in what may seem a lack of Reality: “No memory, no image, no dream” (M. Luzzi “Dove non eri quanta pace: il cielo”). If her work, on the theoretical-critical and methodological level, seems predisposed to a very conditioned perception, the element that supports the whole expressive architecture of Cecilia Vissers still has to be presented: the “earth-line”. The photographic document that precedes and exponentially adjoins the sculpture, is in fact the “visual caption” of the work, the element of a heritage on which the plastic dimension and the chromatic structure of the work are built. The landscape and boundaries between the sky, the sea and the earth, at which art has constantly looked at over the centuries, exemplify the origin of an abstraction process in which the line that draws the contour, becomes the sole and fundamental linguistic element. Compared to the environmental dimension and its infinite figures that constitute reality, the line that separates – the line that develops and breaks – draws-cuts the steel and aluminium plates, building Cecilia Vissers’ work. The photographed landscape responds to a clear look, an objective that details its formal structure, giving up the romantic dimension of mists and Atlantic fogs, ideally recalling Cézanne’s synthesis processes. In the frame of this critical analysis, the photographs that document the net outlines of a hill, a coastline, disclose the vital humus of Cecilia Vissers’ creative action origins, qualifying the depth of its results. Please find enclosed the catalog of the exhibition.